Albright Patents LLP is proud to sponsor Hammer Out, a UK Registered Charity which provides much needed support and counselling to those suffering from brain tumours. We had great pleasure in producing a calendar for 2013 in their support. The photographs in this calendar were taken by Stefania Distante, a close personal friend of one of the Partners of Albright Patents LLP. Stefania’s story is one of fear and strength. She explains on the back page of the calendar that life saving surgery encouraged her to follow her dream of photography which rewards her with feelings of purpose and satisfaction which withered when she lost her job after brain surgery. Following brain surgery, it is very common to suffer regular headaches which for some time can be debilitating and can make working, for example in office environments, impossible. We have been inspired by Stefania’s story and are delighted to be able to support this highly worthwhile charity. 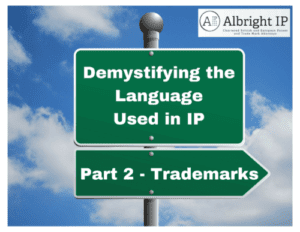 You should register your Trademarks in the form(s) that you use them. If you use a word and a Logo, the strongest protection is usually gained by registering both.